We’ve talked a bit about Tim Cameron’s Rock Racing Buggies in the past, most recently when he snapped the front drive shaft and wheel assembly on his “MoneyMaker” buggy. Well last weekend he showed up at the second race of the Southern Rock Racing Series (SRRS) with his brand new rig that he’s calling, “Unfinished Business.” The first thing you notice is that it doesn’t have the Independent Front Suspension that his MoneyMaker had on it. Instead, Cameron went back to the familiar solid axle format that he has been so successful with in the past. 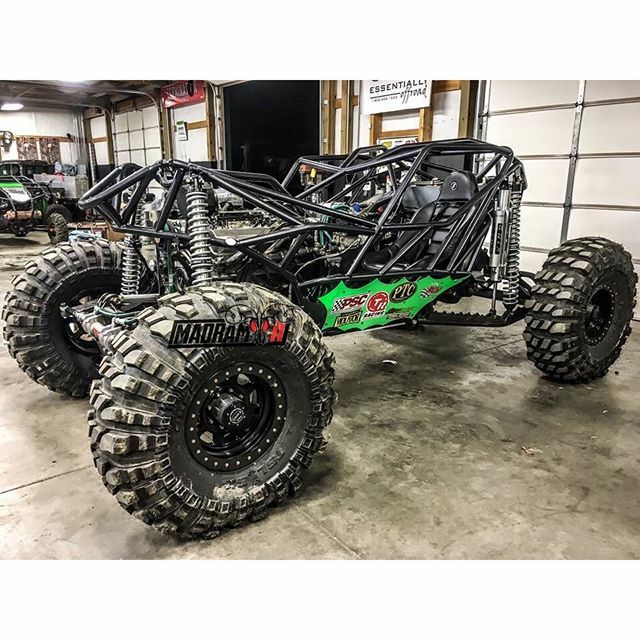 The solid axle is known for being tough enough to handle the sort of punishment that these rock bouncers can produce and to make sure this front axle was never going to break, Tim decided to use the same axle that he is using for the rear, a super beefy Dana 80. To follow Tim Cameron Racing Go Here. To Follow MotoNetworks Go Here. Notice how the Front end doesn’t have all of the King Shocks installed yet. Another thing I noticed in the video of him winning the event is those monster King Shocks on the front and back, they’re HUGE! They look like the ones you see on a trophy truck, and that is awesome! When you see him flying up the hill and that suspension just seems to soak up every bump without breaking his stride. Apparently this new buggy is a brand new build from the ground up, there were a few parts that came off MoneyMaker, like the engine and fuel tank, as well as the a few parts of the dashboard. But as you’ll see in the video, Tim goes through explaining all the different parts of the new buggy and he is very quick to point out that this is a totally new frame and buggy. He even makes it a point at the end of the video to show whats left of the MoneyMaker sitting out behind his shed! Here is the video of Unfinished Business running to the top of the two different hills at the SRRS race this past weekend where it took home the top spot which is pretty damn good for this buggy’s first event. When you see Cameron attacking these hills he almost makes them look easy, but we assure you they are not. Just as a point of reference, we wanted to show you other competitors taking on the two hills. The videos are a little long but they do show the runs of most of the competitors, so you see some good roll-overs and some make it to the top and some don’t.